If you're like me, I am fascinated about Collectors and their collection. I want to introduce a variety of full time collectors that are very active in this community. Also, from their answers will help give you a more clearer idea on who we are as Collectors. We're normal, but with a purpose in life. We are dedicated to our passion in life. We just choose this brand: Sanrio/Hello Kitty. 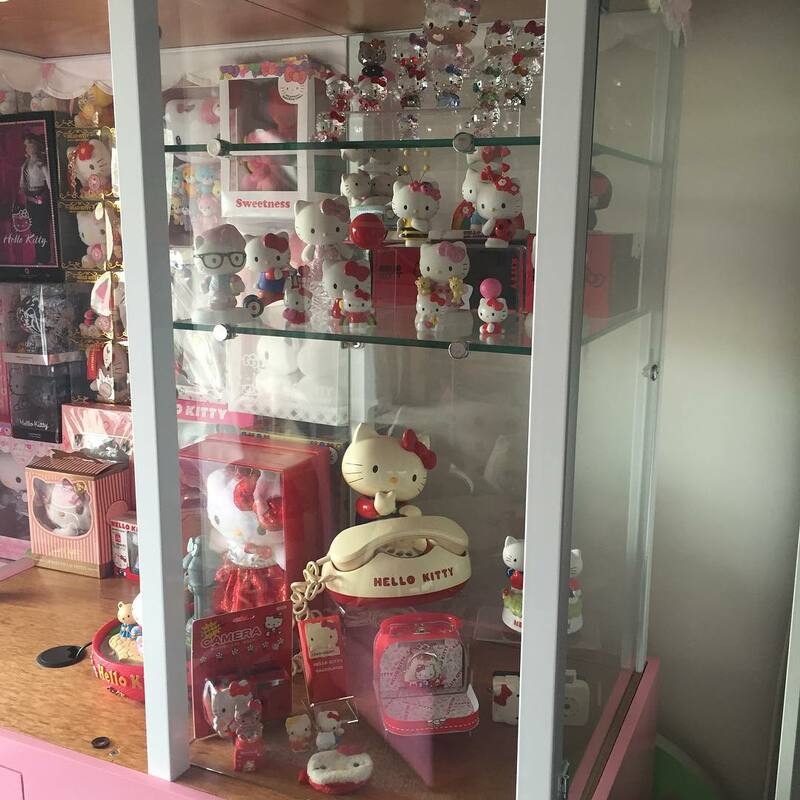 If you have been around the Hello Kitty community for a period of time, then you will probably recognize this spectacular collector. 1. Which character is your ultimate favorite? 2. List your TOP 5 Sanrio Characters in numerical order. 3. Do you collect other Sanrio characters beside your ultimate Fave? 4. How did you first start collecting? When I was 4 years old, there was a little Sanrio store across the street from my house, my mom would always take me in there and get me a little gift and its stuck ever since. 5. Have you ever stopped collecting for a short to long periods of time? NEVER. It's only gotten worse as I’ve gotten older. 6. What type of Collector are you? 7. Would you describe yourself as a Hoarder? If someone called you a hoarder, would you be okay with it or try to defend your collector status? If so, what would you say to them? 8. As a collector, do you depend on your social media to display your collection? Do you think that is key to maintaining your obsession? I don’t depend on social media to display my collection, but it sure helps in sharing the joy and happiness with other collectors. I’ve been obsessed long before social media was so prominent in our society, but it does help you get in touch with other fans, and products that may be hard to acquire otherwise. 9. Ever since you joined the Sanrio Community, has it changed your life? Has being a Collector been beneficial to you? Please give details. Yes, BIG time. 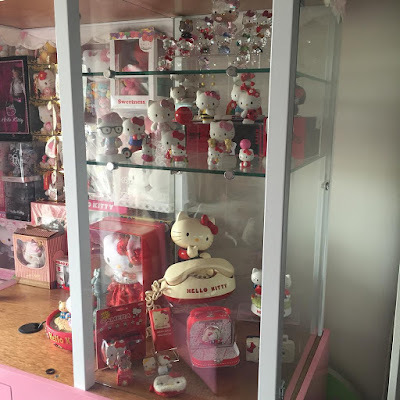 I usually do a hello kitty trip once a year, and being part of the Sanrio community on Instagram, has given me the opportunity to meet collectors all over the word, they are also willing to help you acquire items that they don’t sell in your country. 10. Does any of your collection set you apart from other collectors? Or is yours the same like the rest? I was very lucky to get my hands on a hello kitty popcorn display cart recently. I would say it’s a VERY hard to get item. That sets my collection apart from others. I’ve switch focus on more limited edition items or hard to find items: Figurines, plushes, kitchenware, and vintage items, too. I use to hate plushes, but now they have overtaken my apartment and I love them. 13. As collectors, we all have favorite pieces. What is your ULTIMATE favorite piece in your collection? Does it have a story behind it? How did it come about? Probably my little Hello Kitty coin purse wristlet. I have had it ever since I can remember. When I was 19-- my house burnt down in a forest fire and I lost everything, except a small box of random things. The vintage wristlet survived. So, now it has so much special meaning for me. 14. Do you have any regrets in spending so much on Sanrio? If you weren’t a Collector, do you think you would be obsessing over something else? If so, what? Money is something that is always coming and going, I work to enjoy life and hello kitty, she makes me happy, isn’t that what life is about? No regrets. 15. How many years have you been a collector? 16. Can you give any advice to new collectors starting out? Never let anyone tell you its stupid or convince you to stop collecting. If it makes you happy, do it. 17. How would you describe yourself as a Collector? 18. Can you share any experiences that someone insulted or insinuated something negative over your obsession personally to you? How do you deal with it? Some guys think I'm crazy, been called immature for it-- but I just shrug my shoulders. I've always been pretty solid in knowing who I am. I know when people don’t really understand because they act in a negative way, and that’s okay-- I try to not let it affect me. In the long run it's my life. 19. Objectively, can you see yourself still collecting Sanrio when you’re elderly? Full time or casually? Yes, I plan on it. Full time, of course. I feel like Hello Kitty is something that is with you for life. 20. 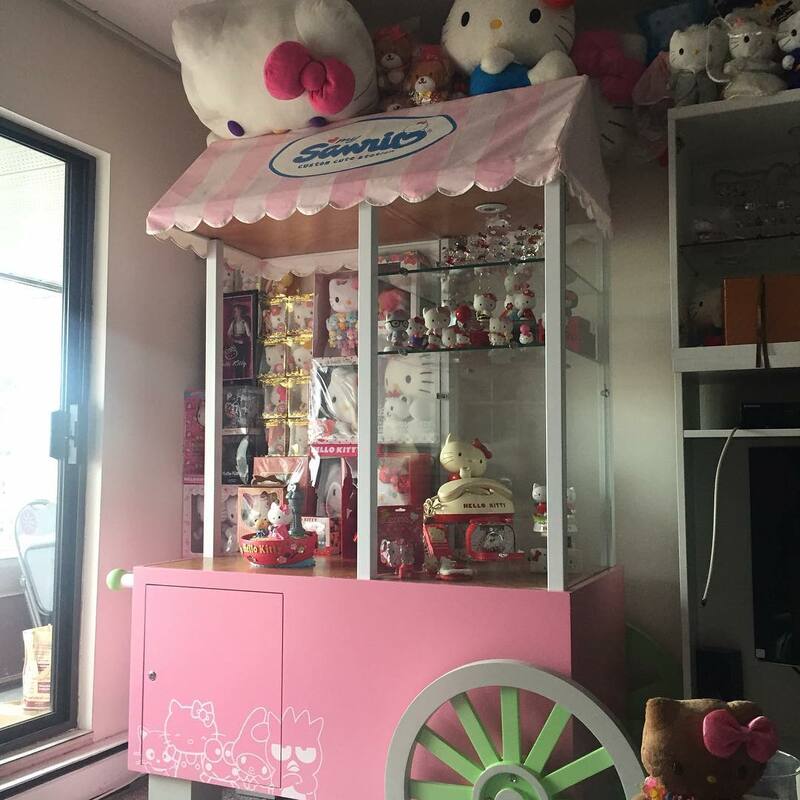 Do you have a storage area for your extra Sanrio merchandise? Is it for a future home or just a storage area? Yes, I have a large storage closet and a huge deck (they are both full of bin on bin on bin). Until I move into my dream home and can have a huge display area.